Russia is a great potential market for the Pakistani product which is hitherto unexplored to the desired level; this was stated by Mr. Zubair Ahmed Malik President Federation of Pakistan Chambers of Commerce and Industry in a meeting with Mr. Yury Kozlov, Trade Representative of Russian Federation who paid courtesy call on President FPCCI along with his four member team. Mr. Zubair Ahmed MAlik, President FPCCI is presenting FPCCI Crest to Mr. Yuri M. Kozlov Trade Representative of Russian Federation. Mr. Naveed Jan Balouch, Vice President FPCCI, Mr. Farooq Afzal, Chairman Pak-Russia Business Council, Mr. Waheed Ahmed and Mr. Fareed Ahmed Directors, Pakistan Russia Business Council, Mr. Maher Alam Khan Acting Secretary General and Mir Nasir Abbas Director General FPCCI and others are also seen in picture. During the course of the meeting, both the side exchanged views on the existing bilateral trade and economic relations. They expressed their dissatisfaction on the present volume of trade which doesn’t reflect the true picture of the fifty years friendship between the two countries. Mr. Zubair A Malik re-affirmed that the Russia will be our potential market during the current year and FPCCI will use all its resources to penetrate the Russian market. He emphasized that the national Chambers of both countries should intensify their interaction and activate the Pakistan-Russia Joint Business Council formed by both National Chambers for exploring the market potentials. He also suggested to Russian Representative to play an instrumental role in organizing the Joint Business Council meeting between the two countries at the earliest, so that the private sector of both countries could formulate necessary recommendations for promotion of bilateral trade and same could be presented in Joint Ministerial Commission (JMC). Mr. Zubair A. Malik further stated that FPCCI is keen to organize single country exhibition in Moscow and will also send a high level trade delegation to Moscow to provide opportunities to Pakistani exporters to expand the volume of Pakistan’s export to Russia. He further informed that current volume of bilateral trade between two countries is US$ 542 million which is in favor of Pakistan, but doesn’t match anyway with the potentials of both countries. Mr. Zubair Ali Malik also emphasized on the need of joint venture investment in various field particularly in the field of power sector projects, exploration of coal and other mineral resources, hydroelectric power, ship-building, high-tech machinery, infrastructure, transport, iron and steel, railways, construction etc. He suggested that both countries should join hand in economic activities without any external pressure. He added that Pakistan Steel Mills is symbol of friendship between two countries but after its establishment no mega project has been undertaken by Russia in Pakistan. He further discussed the stuck up of funds of Pakistani businessmen in Russia due to non-availability of banks branches. He further highlighted various impediments faced by Pakistani businessmen in Russia in getting visa, market access, obligation of standardization and custom requirements. 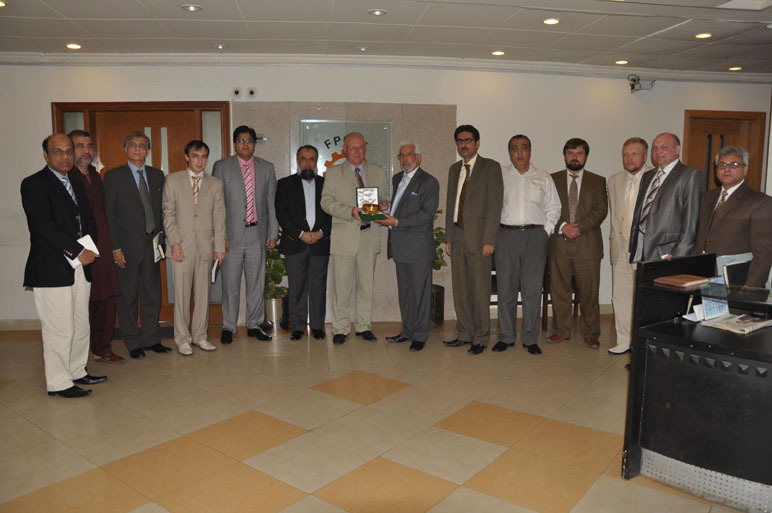 He also advised that Russia should sign currency swap agreement with Pakistan for the promotion of bilateral trade. Moreover, the opening of bank branches and frequent direct flights can help the both countries in improving the bilateral relationships. Mr. Yuri M. Kozlov Trade Representative of Russia informed that Russia gives 25 percent concession to Pakistani exporters on their products, but Pakistan has not utilized this concession in efficient manners. He stressed on the need for strengthening bilateral relations between Pakistan and Russia and to explore trade opportunities for improving the joint venture investment climate and expanding direct contacts between the two countries’ business communities. He said that there is a great scope of Pakistani textile and textile made ups, agro-based products, fruit particularly kinoos and mangoes, food processing and packaging, livestock and dairy farming, leather and leather products, surgical equipments and sports goods etc in Russian markets. Mr. Farooq Afzal Chairman Pak-Russia Business Council of FPCCI emphasized on the need of exchange of technology, aggressive marketing of Pakistani product in Russia and opening of bank branches in each other countries to facilitate the private sector. The meeting was also attended by prominent businessmen including Mr. Naveed Jan Balouch, Vice President FPCCI, Mr. Farooq Afzal, Chairman Pak-Russia Business Council, Mr. Waheed Ahmed and Mr. Fareed Ahmed Directors, Pakistan Russia Business Council.